For anyone who's ever been fascinated by the process of dyeing, our indigo class offers the opportunity to go much deeper—both in knowledge and in the deep, indigo blue colors that emerge from the dye baths. Our indigo classes are taught by Kathryn Davey who works in fiber arts of all manner. Besides her beautiful indigos, Kathryn also crafts dolls, creatures, superheroes, tote bags, beautifully made aprons, and felt ball mobiles. Kathryn began class by giving students booklets outlining the process of indigo dying. She also taught students about the history of indigo, including where indigo plants are grown, how they are harvested, and stored. The results were truly stunning, and it was fascinating to observe how different techniques produced such varying results. Students left class with a gorgeous set of hand-dyed indigo napkins they'd made themselves, as well s with reference materials detailing how to make their own vat of dye, as well as where to procure materials. Kathryn Davey teaches this class on a recurring basis, so be sure to check the calendar to find out when her next class will be held! Posted on April 13, 2014 by Marie Muscardini. Who's ready for a party? We certainly are! With that idea in mind, we hosted the Party in a Box class, taught by Handcraft Studio School's own Marie Muscardini. For this class, participants embellished simple paper party supplies, creating something noteworthy and unique for their next celebration. Supplies for the class included crepe paper, inexpensive, machine-made pom poms, party hats, blowers, twine, a glue stick, tacky glue, Marie's favorite confetti, and a pair of sharp scissors dedicated exclusively to paper use. Marie led the glass through a variety of custom additions to this standard box of supplies. Some of the customizations included adding pom pom onto party hats, embellishing blowers with fringe and pom poms, and creating garlands for the wall as well as mini garlands for cupcake toppers. Marie also revealed her favorite local party supply resources—make sure to sign up for the next class to get her inside tips. We think it's safe to say that a good time was had by all! Posted on April 12, 2014 by Marie Muscardini. Do you need to throw a party, but are looking for a larger, more adaptable space than your home can supply? Fear not: Handcraft Studio School can help. Besides all of our fantastic classes, the studio is also available to host many different types of events, including birthday parties and baby showers. For these types of parties, the family and friends responsible for throwing the party coordinate and supply all of the food and drinks, but we work with the host to customize the space and create a beautiful project. 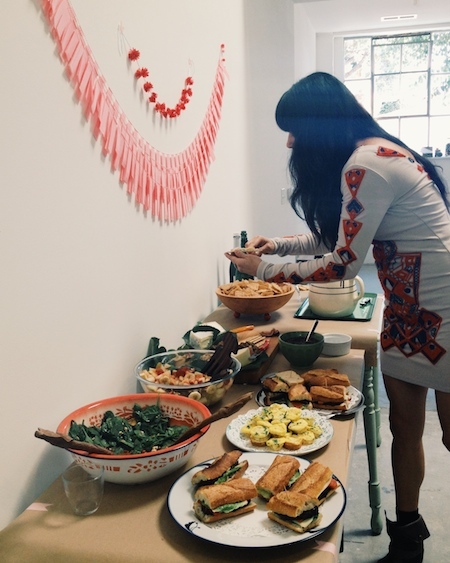 One weekend in October, Handcraft Studio School hosted two baby showers back to back. The first was a charming woodland-themed baby shower. The tables were decorated with greenery and brightly colored mushrooms, as well as other woodland-oriented decor. Guests worked diligently on a special project for the mother-to-be. Can you guess what it was? For the woodland-themed baby shower, we created a woodland felted mobile for the baby's room. Each person at the shower completed a different woodland animal using felt and stuffing and thread. Marie then finished the woodland animal mobile after the party and delivered it promptly to the mom-to-be. Guests enjoyed delicious snacks and drinks and also played some fun party games. Our second baby shower of the weekend honored a mom-to-be who was expecting her second child. For this party, guests created paper and pom pom garlands, one to keep for themselves and one for the mom-to-be. The guests decorated the garland for the mom-to-be with little blessings, with the intention of hanging the garland in the new babe's room. Again, Marie assembled the garland after all guests contributed to it so they would have time to enjoy each other's company. If you're interested in holding a baby shower at Handcraft Studio School, make sure to contact the studio here. Looking for more ideas for parties? Handcraft Studio School can also host . . .
And most other fun events you can imagine! Posted on March 12, 2014 by Marie Muscardini.